Edward III, King of England, eldest son of King Edward II and Isabella of France, was born at Windsor on the 13th of November 1312. In 1320 he was made Earl of Chester, and in 1325 Duke of Aquitaine, but he never received the title of Prince of Wales. Immediately after his appointment to Aquitaine, he was sent to France to do homage to his uncle Charles IV, and remained abroad until he accompanied his mother and Mortimer in their expedition to England. To raise funds for this he was betrothed to Philippa, daughter of the count of Hainaut. On the 26th of October 1326, after the fall of Bristol, he was proclaimed warden of the kingdom during his father's absence. On the 13th of January 1327 parliament recognized him as king, and he was crowned on the 29th of the same month. For the next four years Isabella and Mortimer governed in his name, though nominally his guardian was Henry, Earl of Lancaster. In the summer he took part in an abortive campaign against the Scots, and was married to Philippa at York on the 24th of January 1328. On the 15th of June 1330 his eldest child, Edward the Black Prince, was born. Soon after, Edward made a successful effort to throw off his degrading dependence on his mother and her paramour. In October 1330 he entered Nottingham Castle by night, through a subterranean passage, and took Mortimer prisoner. On the 29th of November the execution of the favorite at Tyburn completed the young king's emancipation. Edward discreetly drew a veil over his mother's relations with Mortimer, and treated her with every respect. There is no truth in the stories that henceforth he kept her in honorable confinement, but her political influence was at an end. Edward III's real reign now begins. Young, ardent and active, he strove with all his might to win back for England something of the position which it had acquired under King Edward I. He bitterly resented the concession of independence to Scotland by the treaty of Northampton of 1328, and the death of Robert the Bruce in 1329 gave him a chance of retrieving his position. The new king of Scots, David, who was his brother-in-law, was a mere boy, and the Scottish barons, exiled for their support of Robert Bruce, took advantage of the weakness of his rule to invade Scotland in 1332. At their head was Edward Baliol, whose victory at Dupplin Moor established him for a brief time as king of Scots. After four months Baliol was driven out by the Scots, whereupon Edward for the first time openly took up his cause. In 1333 the king won in person the battle of Halidon Hill over the Scots, but his victory did not restore Baliol to power. The Scots despised him as a puppet of the English king, and after a few years David was finally established in Scotland. During these years England gradually drifted into hostility with France. The chief cause of this was the impossible situation which resulted from Edward's position as Duke of Gascony. Contributing causes were Philip's support of the Scots and Edward's alliance with the Flemish cities, which were then on bad terms with their French overlord, and the revival of Edward's claim, first made in 1328, to the French crown. 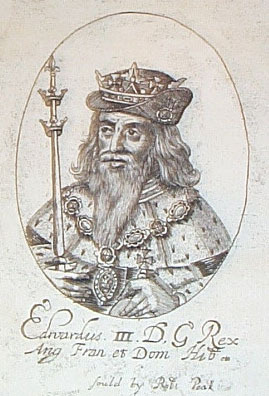 War broke out in 1337, and in 1338 Edward visited Coblenz, where he made an alliance with the emperor Louis the Bavarian. In 1339-40 Edward endeavored to invade France from the north with the help of his German and Flemish allies, but the only result of his campaigns was to reduce him to bankruptcy. In 1340, however, he took personal part in the great naval battle off Sluys, in which he absolutely destroyed the French navy. In the same year he assumed the title of King of France. At first he did this to gratify the Flemings, whose scruples in fighting their overlord, the French king, disappeared when they persuaded themselves that Edward was the rightful King of France. However, his pretensions to the French crown gradually became more important. The persistence with which he and his successors urged them made stable peace impossible for more than a century, and this made the struggle famous in history as the Hundred Years' War. Until the days of King George III every English king also called himself King of France. Despite his victory at Sluys, Edward was so exhausted by his land campaign that he was forced before the end of 1340 to make a truce and return to England. He unfairly blamed his chief minister, Archbishop Stratford, for his financial distress, and immediately on his return vindictively attacked him. Before the truce expired a disputed succession to the Duchy of Brittany gave Edward an excuse for renewing hostilities with France. In 1342 he went to Brittany and fought an indecisive campaign against the French. He was back in England in 1343. In the following years he spent much time and money in rebuilding Windsor Castle, and instituting the Order of the Garter, which he did in order to fulfil a vow that he had taken to restore the Round Table of Arthur. His finances, therefore, remained embarrassed despite the comparative pause in the war, although in 1339 he had repudiated his debt to his Italian creditors, a default that brought about wideapread misery in Florence. A new phase of the French war begins when in July 1346 Edward landed in Normandy, accompanied by his eldest son, Edward, prince of Wales, a youth of sixteen. In a memorable campaign Edward marched from La Hogue to Caen, and from Caen almost to the gates of Paris. It was a plundering expedition on a large scale, and like most of Edward's campaigns showed some want of strategic purpose. But Edward's decisive victory over the French at Cr�cy, in Ponthieu on the 26th of August, where he scattered the army with which Philip VI attempted to stay his retreat from Paris to the northern frontier, signally demonstrated the tactical superiority of Edward's army over the French. Next year Edward effected the reduction of Calais. This was the most solid and lasting of his conquests, and its execution compelled him to greater efforts than the Cr�cy campaign. Other victories in Gascony and Brittany further emphasized his power. In 1346, David, king of Scots, was also defeated and taken prisoner at Nevilles Cross, near Durham. In the midst of his successes, however, want of money forced Edward to make a new truce in 1347. He was as far from the conquest of France as ever. Edward returned to England in October 1347. He celebrated his triumph by a series of splendid tournaments, and completed his scheme for the establishment of the Order of the Garter. In 1348 he rejected an offer of the imperial throne. In the same year the Black Death first appeared in England, and raged until 1349. Yet the horrors which it wrought hardly checked the magnificent revels of Edward's court, and neither the plague nor the truce stayed the course of the French war, though what fighting there was was indecisive and on a small scale. Edward's martial exploits during the next years were those of a gallant knight rather than those of a responsible general. Conspicuous among them were his famous combat with Eustace de Ribemont, near Calais in 1349, and the hard-fought naval victory over the Spaniards off Winchelsea in 1350. Efforts to make peace, initiated by Pope Innocent VI, came to nothing, though the English commons were now weary of the war. The result of this failure was the renewal of war on a large scale. In 1355 Edward led an unsuccessful raid out of Calais, and in January and February 1356 harried the Lothians, in the expedition famous as the Burned Candlemas. His exploits sank into insignificance as compared with those of his son, whose victory at Poitiers, on the 19th of September 1356, resulted in the captivity of King John, and forced the French to accept a new truce. Edward entertained his royal captive very magnificently, and in 1359 concluded with him the treaty of London, by which John surrendered so much that the French repudiated the treaty. Edward thereupon resolved to invade France afresh and compel its acceptance. On the 28th of October he landed at Calais, and advanced to Reims, where he hoped to be crowned King of France. The strenuous resistance of the citizens frustrated this scheme, and Edward marched into Burgundy, whence he made his way back towards Paris. Failing in an attack on the capital, be was glad to conclude, on the 8th of May 1360, preliminaries of peace at Br�tigny, near Chartres. This treaty, less onerous to France than that of London, took its final form in the treaty of Calais, ratified by King John on the 9th of October. By it Edward renounced his claim to France in return for the whole of Aquitaine. The treaty of Calais did not bring rest or prosperity either to England or France. Fresh visitations of the Black Death, in 1362 and 1369, intensified the social and economic disturbances which had begun with the first outbreak in 1348. Desperate, but not very successful efforts were made to enforce the statute of Labourers, of 1351, by which it was sought to maintain prices and wages as they had been before the pestilence. Another feature of these years was the anti-papal, or rather anti-clerical, legislation embodied in the statutes of Provisors and Praemunire. These measures were first passed in 1351 and 1353, but often repeated. In 1366 Edward formally repudiated the feudal supremacy over England, still claimed by the papacy by reason of John's submission. Another feature of the time was the strenuous effort made by Edward to establish his numerous family without too great expense. In the end the estates of the houses of Lancaster, Kent, Bohun, Burgh and Mortimer swelled the revenues of Edward's children. and grandchildren, in whose favor also the new title of duke was introduced. In 1369 the French king, Charles V, repudiated the treaty of Calais and renewed the war. Edward's French dominions gladly reverted to their old allegiance, and Edward showed little of his former vigor in meeting this new trouble. He resumed the title and arms of King of France, but left most of the fighting and administration of his foreign kingdoms to his sons, Edward and John. While the latter were struggling with little success against the rising tide of French national feeling, Edward's want of money made him a willing participator in the attack on the wealth and privileges of the Church. In 1371 a clerical ministry was driven from office, and replaced by laymen, who proved however, less effective administrators than their predecessors. Meanwhile Aquitaine was gradually lost; the defeat of Pembroke off La Rochelle deprived England of the command of the sea, and Sir Owen ap Thomas, a grand-nephew of Llewelyn ab Gruffyd, planned with French help an abortive invasion of Wales. In 1371 the Black Prince came back to England with broken health, and in 1373 John of Lancaster marched to little purpose through France, from Calais to Bordeaux. In 1372 Edward made his final effort to lead an army, but contrary winds prevented his even landing his troops in France. In 1375 he was glad to make a truce, which lasted until his death. By it the only important possessions remaining in English hands were Calais, Bordeaux, Bayonne and Brest. Edward was now sinking into his dotage. After the death of Queen Philippa he fell entirely under the influence of a greedy mistress named Alice Perrers, while the Black Prince and John of Gaunt became the leaders of sharply divided parties in the court and council of the king. With the help of Alice Perrers John of Gaunt obtained the chief influence with his father, but his administration was neither honorable nor successful. His chief enemies were the higher ecclesiastics, headed by William of Wykeham, bishop of Winchester, who had been excluded from power in 1371. John further irritated the clergy by making an alliance with John Wycliffe. The opposition to John was led by the Black Prince and Edmund Mortimer, Earl of March, the husband of Edward's grand-daughter, Philippa of Clarence. At last popular indignation against the courtiers came to a head in the famous Good Parliament of 1376. Alice Perrers was removed from court, and Duke John's subordinate instruments were impeached. But in the midst of the parliament the death of the Black Prince robbed the commons of their strongest support. John of Gaunt regained power, and in 1377 a new parliament, carefully packed by the courtiers, reversed the acts of the Good Parliament. Not long after Edward III died, on the 21st of June 1377. Edward III was not a great man like Edward I. He was, however, an admirable tactician, a consummate knight, and he possessed extraordinary vigor and energy of temperament. His court, described at length in Froissart's famous chronicle, was the most brilliant in Europe, and he was himself well fitted to be the head of the magnificent chivalry that obtained fame in the French wars. Though his main ambition was military glory, he was not a bad ruler of England. He was liberal, kindly, good-tempered and easy of access, and his yielding to his subject's wishes in order to obtain supplies for carrying on the French war contributed to the consolidation of the constitution. His weak points were his wanton breaches of good faith, his extravagance, his frivolity and his self-indulgence. Like that of Edward I his ambition transcended his resources, and before he died even his subjects were aware of his failure. Edward had twelve children, seven sons and five daughters. Five of his sons played some part in the history of their time, these being Edward the Black Prince, Lionel of Antwerp, duke of Clarence, John of Gaunt, duke of Lancaster, Edmund of Langley, afterwards duke of York, and Thomas of Woodstock, afterwards duke of Gloucester. John and Edmund are also important as the founders of the rival houses of Lancaster and York. Each of the last four was named from the place of his birth, and for the same reason the Black Prince is sometimes called Edward of Woodstock. The king's two other sons both died in infancy. Of his daughters, three died unmarried; the others were Isabella, who married into the family of Coucy, and Mary, who married into that of Montfort.